The Machinery & Medical Infrastructure Division is made up of three businesses which made up the former Infrastructure & Environment Business Division: plant projects, industrial machinery and bearings, and medical infrastructure businesses. Our mission is to harness our domestic/overseas partner network and diverse business functions cultivated through our well-established plant project business to build the kind of basic infrastructure necessary for industry in countries around the world. Demand for industrial plants to support economic development in emerging countries is expected to continue growing. In these years, we completed three gas chemical plants in Russia and many are under negotiation. While continuing with this existing EPC business, we are also focusing on new fields in and in which Sojitz specializes. Some examples are environment-based projects such as waste material recycling, such as Energy from Waste. Even for existing businesses, such as industrial machinery and bearings, we plan expand the scale of trading based on the demand for electronization, automation, and improved productivity in industrialized societies. For the public private partnership (hereinafter “PPP”) hospital operation project in Turkey, we will establish a revenue model which includes facility operation services. We can use our existing diverse network of companies to find collaborators to develop medical robots and undertake other activities based on local medical, health, and nursing care needs. We also seek to explore new business opportunities in the future by broadening our outlook to include other businesses in the category of healthcare, beyond medical facilities. The government of Turkey introduced national public insurance system in 2008. This resulted in more Turkish citizens with health coverage—improvements in average life expectancy (rising from 71 to 75 years within a 10-year period) and infant mortality rates being the biggest indicators. Meanwhile, it also led to more patients. Modernization of state hospitals and improvement of medical treatment are challenges for the country. To deal with this pressing healthcare need, the Turkish Ministry of Health planned a range of investment to create more hospitals, using a scheme whereby public and private organizations collaborate to provide nationalized service as well as investment to increase the number of hospital beds to 40,000. Sojitz concluded a 25-year contract with the Turkish Ministry of Health to participate in the construction and business operation for the Ikitelli Integrated Health Campus. 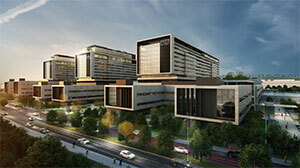 One of the largest Health Campuses is located in Istanbul and houses 2,682 hospital beds with a cardiovascular hospital and an oncology hospital, among others. The facilities are under construction and scheduled to begin operation in October 2020. Sojitz will contribute to improving the quality of life for people in emerging countries and create new employment opportunities by expanding advanced healthcare infrastructure and engaging in various businesses from management of facilities to related healthcare services. Bearings are considered crucial components of the machinery industry and require a stable supply around the world as something essential to the advancement of industrialized societies around the world. We have positioned bearings as one of the major products and are building a supply chain for our industrial machinery and bearing business that can contribute to worldwide business development across the globe. We are supplying bearings to all parts of China through our dealership network and a joint venture with NSK, which manufacturers finished bearings. 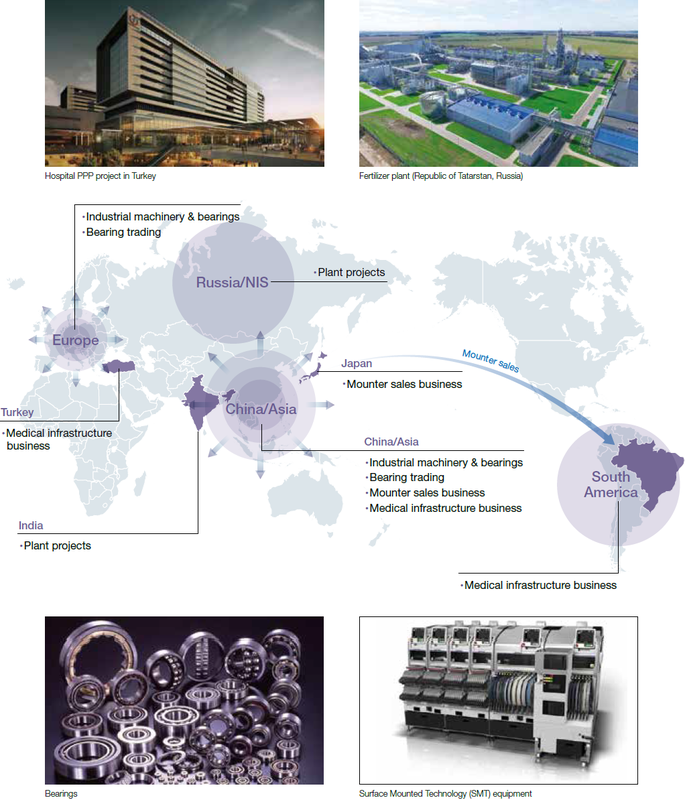 Moreover, several component processing businesses we have in China serve as a components production base for major bearing plants in the world. Through these, we will continue contributing to the development of regional industries by supporting management of operating companies. 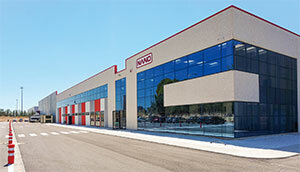 In 2016, we also began investing in a bearing component manufacturing company in Spain with the aim of expanding our business foundation in Europe. We will contribute to the development of the region’s industry by using this company as a stepping stone to establish partnerships with European enterprises.